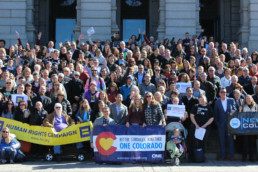 We need YOUR support to continue to run our programs and fight for equality for the LGBTQ community in Colorado. Sign up to get breaking news and updates on what One Colorado is doing to advance equality and opportunity for LGBT Coloradans and their families. Use the form below if you'd like for One Colorado to attend your event.